Have you ever been humble? No? Oh…well, let me tell you what it’s like. I’d prayed about it a while, wondering why I felt such shame when I should feel freedom. I wanted to be bold like the apostles, even in the face of death, pain, imprisonment, or worse yet, people giving me odd looks. 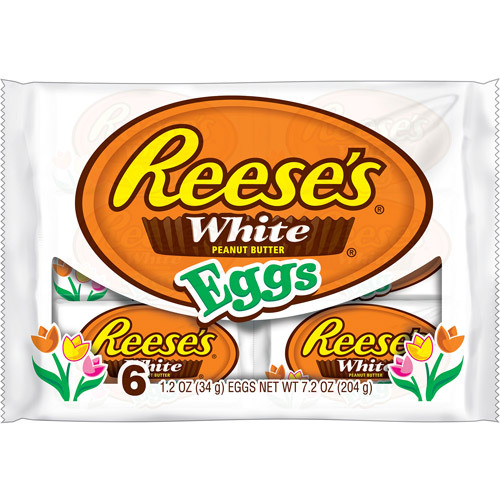 A white chocolate Reese’s egg. Photo courtesy of Walmart, oddly enough. Some of you don’t like white chocolate. You’re thinking, “It’s not REALLY chocolate.” Well, neither is pizza, but that’s delicious, too! You don’t like it? GIMME YOURS!! And Reese’s peanut butter? The EGG-level of peanut butter? WHOO! I was on that bad boy like Lindsay Lohan on methamphetamine! I literally did a sort of hippity-hop from one side of the aisle to the other and snatched that sucker up, not giving a flying fornication who saw me lose my mind over a piece of candy. Is that messed up or what? I’m a believer that Jesus died for my sins and rose on the third day, and I’ll blab all about it here on the internet (read the rest of my blog. It’s amazing.) but out in the real world? I get shy and quiet, and I don’t want to rock the boat. I’d knock down a 5-year-old crippled Ethiopian kid to get some candy, but I’m too scared to even say Jesus’s name in public. So, something has to change. The cool thing is that God only feeds us humble pie because he knows it’s good for us (pie is never good for you, but you get the point). God only points something out to correct it, not to bring shame or condemnation. So now that I’m aware, I have to do something about it, through his power. It’s time to be braver, to boldly state my faith in public, even if they look at me weird or call me names like bigot, right-winger, hypocrite, or a dozen other things. Or maybe I just need to get more excited about Jesus, so excited that I lose my mind in public like a girl at a Justin Bieber concert. Or a girl at a Beetle’s concert. Or a girl at an Elvis Presley concert. Girls are excitable at concerts. The point is that when you really treasure something, like good candy, it’s easy for you to go a little bonkers because you love it/them so much. That’s what I really want: to grow in my love for God. We should all love God like that. But as I’ve often told you, “Should denies reality”. But now I’m gonna think of God every time I see a Reeses! You’re Hilarious!!! Ever think of doing stand up comedy? I love Reese’s too! But it’s true at this time in our country it’s not always easy to share your faith. My general rule is to build a relationship first. Or since I ride the bus look for ways to do an act of kindness and that’s my open door.